below you find a sketch drawing from a German grappling manual dated to ca. AD 1545 (Cod.I.6.2º.4., Folio 4recto). It can be found in various others medieval manuals and must be considered to have been a standard application at the time. Wouldn’t this be a piece for the next karate or (stand up) jujutsu class? 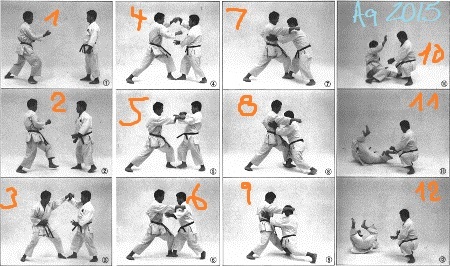 Of course, because can be interpreted as an application of actions found in various kata of Okinawa Karate. For instance, it can be explained as an application for an action found at the end of Shisochin. Or in the following photos showing Taira Shinken and Mabuni Kenwa in the 1930s. Taira Shinken and Mabuni Kenwa demonstrating applications. From Mabuni Kenwa: Karate Do Nyumon, 1938. Even more obvious it is an explanation for what is sometimes referred to as the “dog-posture” (Inu-kamae 犬構え) found at both the end of Sanseru and Suparinpei. From: Higaonna Morio. Okinawa Goju-ryu. 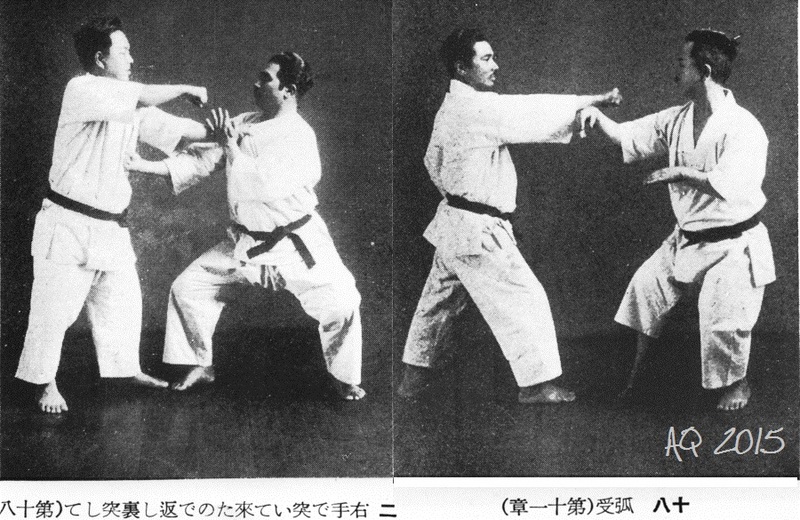 Application of the Kata. Part 2. From. Zhao Da Yuan: Cin Na. 1993. As can be understood from the above, technique is not limited to, restricted or even owned by a specific period in time, a place, or a race. In fact, it all follows the same principles. For example, and besides the medieval Western manuals as THE example, it was clearly formulated in Chinese Qinna. Heed number 3 and add it to practice. 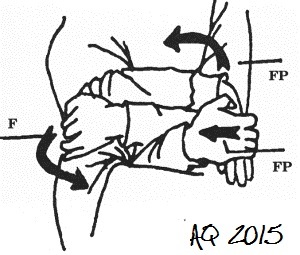 Third: Take what you want and proceed from hooking, seizing, locking and immobilizing the terminus. This entry was posted in Unknown Ryukyu and tagged and Mabuni Kenwa, German grappling manual, Higaonna Morio, Inu-kamae, Okinawa Karate, Qinna, Sanseru, Suparinpei, Taira Shinken, 犬構え. Bookmark the permalink.